In October 2009, Randal Bishop cycled some 1200 km from his hometown of Gympie, Queensland to the Prince of Wales Hospital in Randwick, Sydney. Randal made this journey a tribute to his 17 year old daughter, Shaynae, who passed away from brain cancer in July that year. Randal had aimed the journey (known as Shaynae’s Ride) at raising community support for research into the management of, and ultimately a cure for, the disease. Besides receiving donations that were channelled towards brain cancer research and management, further building of community support was manifested through the many forms of media exposure that occurred during the ride. The route took Randal from Gympie via Brisbane to the New South Wales Northern Rivers area and then up on to the New England Tableland via Tenterfield. The trek then took him through towns such as Armidale and Tamworth to the so called ‘Southern Slopes’, then to the Hunter Valley and then on to Sydney. Encouraged by the response to the ride, an inaugural Bridge2Bridge (B2B) charity ride was promoted for 2011. Building on the Shaynae’s Ride theme, the B2B ride assembled five riders, this time taking a slightly different route - starting at Brisbane’s Story Bridge and then proceeding to Warwick, Stanthorpe and then on to Tenterfield via Wallangarra. The route was basically similar from Tenterfield on - culminating at Dawes Point under the Sydney Harbour Bridge. To qualify, participants were each asked to contribute about $1,000 to running costs (vehicle hire, meals, accommodation, jerseys, spares, etc) and to each raise a base of $1,500 in donations towards Brain Cancer based charities. Besides raising funds, the ride again took advantage of the various opportunities to get the brain cancer message across through local media and interaction with community groups. The success of the B2B in 2011 prompted further annual rides. Given this continued excellent response, an eighth B2B is being run in 2018 with a maximum of fifteen riders. The rides will continue to be run annually for the foreseeable future. As a charity ride, the B2Bs’ primary focus is gaining financial and political support for research into the management of, and ultimately a cure for, brain cancer. However several other values have become apparent over the conduct of the rides. Firstly, the ride is seen very much as a personal event. This feature stems from the initial Shaynae’s Ride where the distance was covered by an individual who had an inherent interest in making a difference. Unlike major charity rides which may involve tens if not hundreds of riders, the B2B operates with relatively low numbers. This small group configuration tends to continue that personal focus, creates a greater bond between the riders and a greater connection between the riders and the communities that they visit along the way. Secondly, the B2B focuses upon regional Australia. Although the ride begins and ends in a capital city, its route deliberately avoids the more heavily populated and traversed coastal strip. The trail encompasses a number of regional agricultural communities. As such, the ride recognises that brain tumour issues also affect those living in the regions. It recognises that there are difficulties in managing appropriate responses as those within regions may not have as ready access to support services as city folk. Finally the riders appreciate the celebration of life the ride affords. In its own way, the ride provides a challenge to ordinary individuals. In meeting that challenge, it is hoped the experience enriches participants personally. Ultimately, the ride sets an example to the general public that as ordinary individuals we can make a difference. 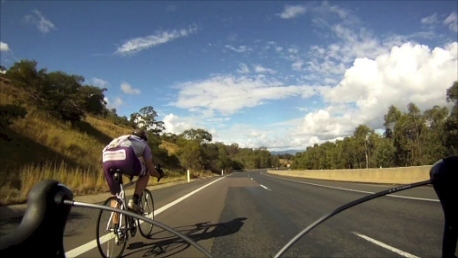 ﻿At this point, it is worthwhile to reflect upon the relationship between the ride and the issue of brain cancer. Basically the support that the ride generates will assist in alleviating the impact of this disease upon society – a disease that has no known cure. Following from the above, there is truth in the suggestion that it has the greatest impact on society of all the cancers. However, in the past 30 years, there have been no significant breakthroughs in brain cancer research. Funds raised from the ride are directed towards supporting collaborative efforts in developing effective treatments. The immediate goal is to increase five-year survival to 50% over a decade.